This problem is common to all Aprilia V twins, and is easy to fix if you deal with it promptly. Especially when braking hard from high speed, the front end shakes violently but the vibration reduces with speed. The symptoms can be mistaken for warped discs, and worn steering head or front wheel bearings, can produce similar effects – so you’ll need to be sure to rule them out by checking for free play. Also look at your tyres. Worn or mismatched rubber is murder on Futura handling. Mostly commonly, and barring other problems in the front end, it’s caused by the bobbins – small metal tubes that the discs float on. These become gummed up with brake dust and stick in place. The problem will happen more often if you don’t ride much and/or don’t apply the brakes hard often. Clean each of the bobbins with a suitable residue-free solvent such as brake cleaner. WD40 is NOT a good idea here. As you clean the bobbins, tighten a nut and bolt of the correct size through the bobbin then turn it using a spanner. As you clean the bobbins will begin to rotate more freely. When you’ve got them all moving freely, you’re done. If freeing off the bobbins doesn’t cause the problem to go away completely, then pad deposits on the discs could be the cause. Clean the discs and the pads with brake cleaner. If this still doesn’t work, you’re most likely looking at warped discs, worn front wheel bearings (common if the bike has been jetwashed a lot) or worn steering head bearings (far less common). 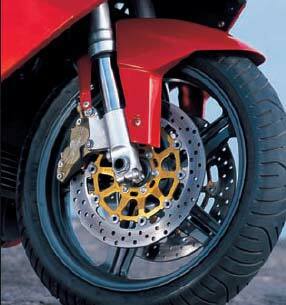 Find out more about replacement front discs.